France's prime minister said on Monday that anti-government 'yellow vest' protesters would be banned from the Champs-Elysees avenue in Paris if authorities deemed that violent groups were taking part with a view to causing chaos. Edouard Phillippe's announcement follows one of the most violent weekends of protests in the French capital. Philippe said in a televised address that France would shut down protests in the three most affected cities — Paris, Bordeaux and Toulouse — if violent groups were known to be taking part. "From next Saturday, we will ban 'yellow vest' protests in neighborhoods that have been the worst hit as soon as we see sign of the presence of radical groups and their intent to cause damage." Philippe said the ban would apply for an unspecified period in the neighborhoods that have been "the most impacted" by the riots in the cities of Paris, Bordeaux and Toulouse. Philippe compared Saturday's "intolerable" violence with climate marches held on the same day during which 145,000 people peacefully protested across France. 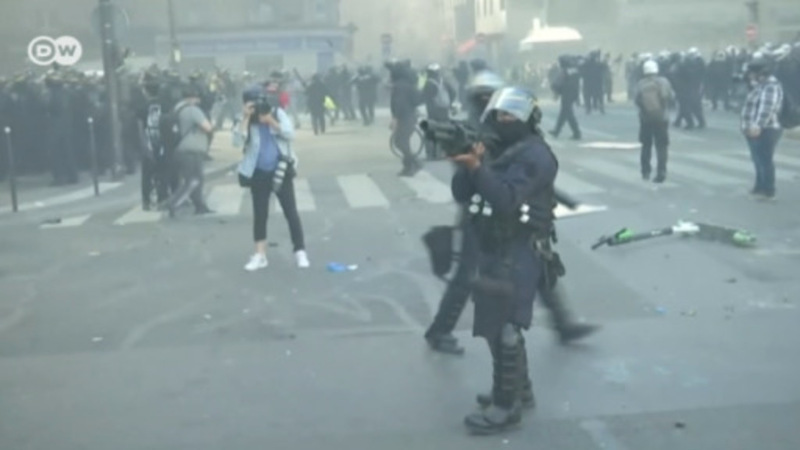 The prime minister said the right to demonstrate would be protected as long as police were notified in advance of protests, as required under French law. Philippe said French authorities would also make full use of new powers passed by parliament last week, which will allow regions to ban specific individuals from protesting, and arrest and prosecute people wearing masks at or near protests. The legislation, which is expected to be signed into law soon, has been criticized by rights groups and the leftist opposition as well as the Council of Europe rights commissioner. French President Emmanuel Macron said he would send the law to France's Constitutional Council for an opinion before he signs it into effect. Hooded rioters in Paris fought with police and set several stores alight on Saturday, as yellow vest organizers sought to breathe new life into a movement that has rocked Macron's administration. Macron promised a crackdown on those who "want to destroy the Republic, at the risk of killing people," after cutting short a weekend ski trip. He also tweeted that the rioting showed that his government needs to do more to address protesters' concerns. Macron's tweet reads: "What happened today on the Champs-Élysées can no longer be called a demonstration. These are people who want to destroy the Republic, at the risk of killing. All those who were there have made themselves complicit in this." Opposition conservative lawmaker Guillaume Larrive slammed the PM's announcement, telling BFMTV it was "not very brave, not very honorable, to turn on officials" such as the Paris police chief. The far-left LFI party slammed the appointment of Lallement, who allegedly defended Bordeaux police officers after LFI deputy Loic Prud'homme accused them of beating him with batons during protests. "After 18 weeks of disastrous management in Bordeaux, Prefect Lallement will be able to give Paris the benefit of his experience in heightening chaos," Prud'homme tweeted.